Five years ago this month MO reported that Bombardier Recreational Products had filed a patent as far back as 2009 for a control system that’d allow the Can-Am Spyder to lean. Later that same year it came to light that Harley-Davidson had been developing a similar tilting three-wheeler (the Penster) for years before scrapping the project and moving in a more traditional-trike direction with the Tri-Glide and recently introduced Freewheeler. Well, guess what? The leaning reverse trike charge isn’t being led or financed by BRP or H-D and their incredibly deep pockets. At the vanguard of the full-size tilting trike revolution is a lone engineer in a garage somewhere in Snohomish, WA. Yes, Honda displayed the leaning, reverse-trike Neowing at last year’s Tokyo Motor Show, but it’s only a prototype. And, yes, Piaggio’s MP3 has been available since 2006, and Yamaha’s Tricity was released last year in Europe (a model for which Yamaha is being sued by Piaggio for copyright infringement), but these are scooters. The Tilting Motor Works Trio is constructed for full-size Harleys: Road King, Road Glide, Street Glide, Electra Glide, Softails, Dynas, Sportsters, V-Rods, and Hondas: Gold Wing, Valkyrie, F6B. The TMW Trio is the brainchild of Bob Mighell. An engineer and motorcyclist, Mighell put metal to grinder a handful of years ago and transformed an inexpensive Honda Rebel into a prototype leaning tricycle. In 2012, Mighell took to the salt of Bonneville with a slightly more powerful version of his original test mule. The 1197cc V-Max V-4 propelled Mighell to 132.245 mph, breaking the land speed record for three-wheeled motorcycles by more than 10 mph. Perfecting his design since Mighell is now busy enlisting dealerships to install and service his unique reverse-trike kit. The Trio conversion costs $9,995 plus installation – the cost of which is model-dependent, i.e., Softail vs. Gold Wing, etc. The Trio’s cosmetic grill is from the mind of celebrated motorcycle designer, Glynn Kerr. Both the nose and fenders are perfectly color-matched to the original H-D paint. Like the Piaggio MP3 we brought along, the most important aspect of the Trio’s design is its ability to lean. In fact, the Trio is perfectly comfortable scraping its floorboards while rounding corners. 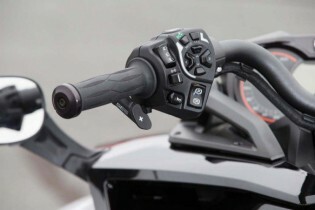 The Trio’s handling is familiarly motorcycle-ish, but two wheels up front, tracking independently of one another, provides foreign feedback through the handlebars.“Although the Trio is doing all the right things when you countersteer, the way the handlebar turns into the corner is initially disconcerting, giving an experienced motorcyclist contradictory sensations,” says Brasfield. The MP3’s front end is comprised of two leading link fork legs that instead of sharing a common wheel between them, are each outfitted with its own wheel. The two wheels steer in concert, but suspension duties are independent of one another. The black fan-looking thing near the steering head is the tilt-lock mechanism that keeps the MP3 from falling over when stopped: basically, a partial brake disc gripped by a caliper. “Although the Trio is doing all the right things when you countersteer, the way the handlebar turns into the corner is initially disconcerting, giving an experienced motorcyclist contradictory sensations,” says Brasfield. The non-leaning Spyder feels the most foreign. “The Spyder feels what I imagine a snowmobile fitted with wheels and tires would feel like, with an aggressive rider flopping his body to the inside of corners to optimize weight distribution,” says Duke. Preceding our ride day, SoCal was hammered by El Nino rains, resulting in gravel-strewn apexes of seemingly every blind corner. If testing two-wheelers was the task at hand, trepidation, and slower speeds would have prevailed, but with two points of contact up front on the Trio, MP3, and Can-Am Spyder F3-T, we flouted these pitfalls with a smirk and fistful of throttle. When braking was in order, the extra grip and stopping power felt like wire walking with a safety net, where a motorcycle is always a front-end slide away from disaster. 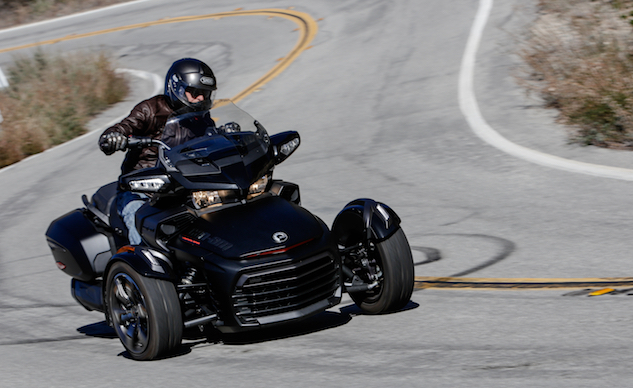 What the Can-Am Spyder lacks in tilt-ability it makes up for with engine performance, rider and passenger comfort, and technical accouterments. The Spyder also doesn’t require a tilt-lock device. The Spyder’s brakes are especially robust. With only a foot pedal activating both front and rear binders, and ABS operating in the background, a rider can haul speeds down from scary fast to a reasonable pace in an easily manageable manner. Producing a claimed 115 horsepower and 96 lb-ft of torque from its 1330cc inline-Triple, the Spyder definitely requires this kind of stopping power. The MP3 is also equipped with ABS, but its 500cc Single doesn’t accelerate you through time and space with the same urgency of the Spyder. 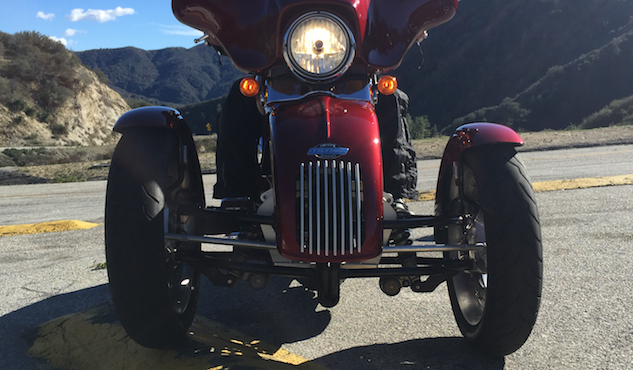 Our Trio was configured to a Harley-Davidson Softail with more power than the MP3 but not nearly as much as the Spyder. 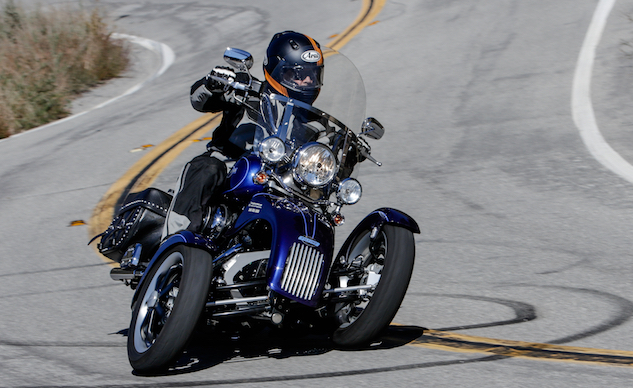 For those desiring a more ebullient experience, customers can choose to mount the TMW front end to a Honda Gold Wing, Valkyrie or F6B with Honda’s 1832cc horizontally opposed six-cylinder producing around 103 hp and 109 lb-ft of torque (we requested that Bob bring one of these models to our next test session). The beauty of Mighell’s design lies not only in the Trio’s ability to lean but also in separating the duties of steering from suspending. Lock-to-lock steering inputs are nearly frictionless, but mechanical stiction can be felt when leaning the Trio from side to side. The quality of the parts and mechanics is top-notch. Note the rim-mounted brake discs. Adjustable front shocks would certainly go a long way in helping to up the Trio’s sporting prowess. Mighell says fully-adjustable suspension will likely be an optional upgrade. For now, the Trios will come outfitted with purpose-built, non-adjustable Progressive shocks. Front-end feedback is best on the MP3, due to its more narrowly spaced wheels and more conventional suspension. The 2016 MP3 is the first MP3 to come stateside since 2010. Recent updates to the model include traction control, larger front wheels (from 13 to 14 inches), wider positioning between the front wheels, restyled front end, larger storage compartment with a USB port and a larger windscreen. It retails for $8,999. At around 600 pounds fueled the MP3 certainly cannot be considered light – especially for a scooter – but it’s easily the lightest of this bunch. Harley claims around 755 pounds for a running Heritage Softail, then add another 100 pounds which is what Mighell tells us is the approximate weight increase of the Trio kit. The Spyder F3-T is the heavyweight of the bunch tipping the scales right around 1,000 pounds. 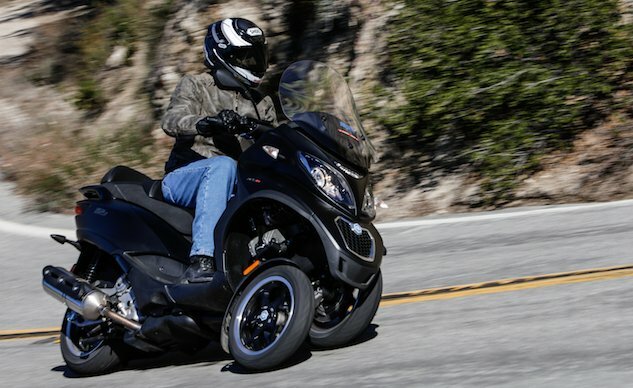 It may not lean, but the Can-Am Spyder oozes electronic tech in the form of ABS, TC, cruise control, optional semi-automatic transmission, and optional heated grips. The Spyder also offers voluminous storage capacity and very comfortable passenger accommodations. Base model F3-Ts start at $23k, the Limited Special Series we tested runs a tad over $27k. One of the most limiting factors of the Trio is its inability to make a sharp U-turn. The forthcoming TiltLock system won’t solve the issue, but it will ratchet down the intimidation factor of U-turns and other slow, parking-lot-type maneuvers. “You can tell this isn’t a vehicle produced by a major OEM by its odd steering responses and ship-length turning radius,” says Duke. The Spyder also requires a wide berth when making U-turns, but then it also has reverse, which can be a real lifesaver in tight situations. TMW’s TiltLock system supports the vehicle at low speeds and when stopped, automatically leveling the motorcycle with the horizon even when the two front wheels aren’t parallel. The TiltLock system is currently under development but should be ready for public consumption later this year. The system adds $3,000 to the cost of the Trio kit, and will be retrofittable to existing models. 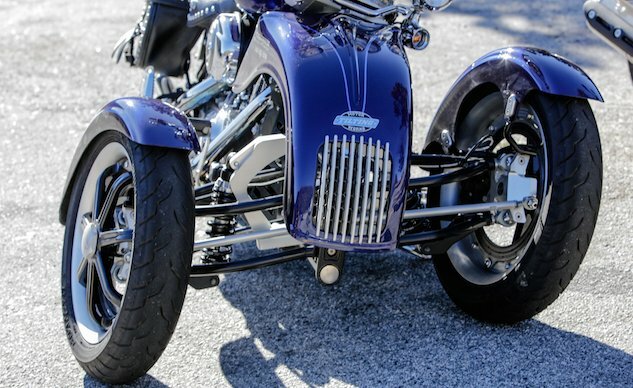 From a nimble, affordable scooter, to a leaning Harley-Davidson and non-leaning Spyder, these three reverse trikes represent the diversity of available tricycles. 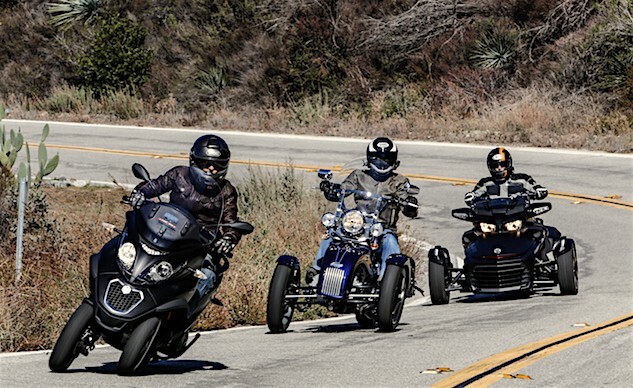 Others exist such as the Polaris Slingshot, Campagna T-Rex, Morgan 3 Wheeler, to traditional trikes like the H-D Freewheeler, or sidecar rigs like Ural’s Gear-Up. While each offers its own version three-wheeled motorcycling, we hope the to see more leaning versions such as the Trio and MP3. If Yamaha and Honda have anything to say about it, we should be enjoying some new leaning toys in the near future, and that’s exciting!